As great as Spyfall is for the right group it needs such a finely tuned and pernickety set of people that in my experience it falls more often than it soars. We gave it three stars in our review – while it’s never been the case that I’ve come away from the game unhappy I have almost always come away from it underwhelmed. There are plenty of people that champion Spyfall to the high heavens though, and perhaps you have access to the kind of gaming group that will get the most out of it. In that case, what you need to know is if you’re going to be able to play it. Is this a teardown? Are we in a teardown? No, seriously, I have no idea – is this a teardown? There is no art in the game that presents colour as the sole channel of information. While this is a game of social deduction, it’s not one of colour interpretation. This isn’t Dixit or Mysterium where the mood or emphasis of colouring might be an important factor. I hadn’t intended this photo to be quite so hard to interpret. Even in situations where a group is highly competitive and willing to stoop to the level of ableism to win a game, there’s no easy way that colour blindness can be used to limit a player’s information. Any question that would focus on colour identification would be equally problematic for any spy without colour complications. We strongly recommend Spyfall in this category. 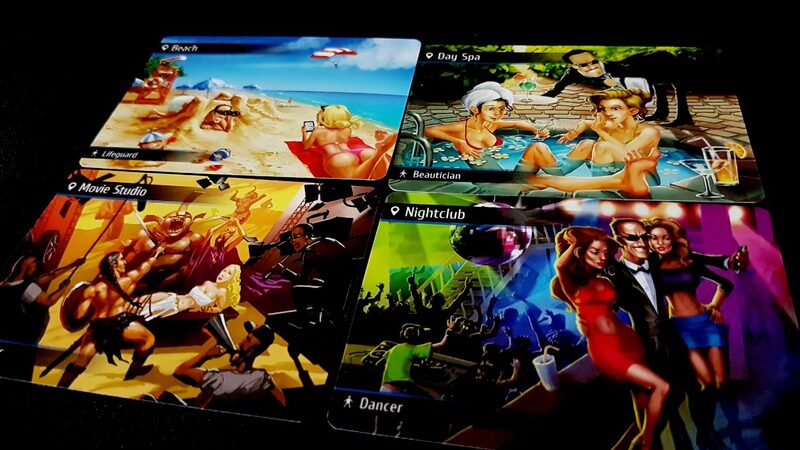 The cards in the game are very visually busy, but Spyfall is a title with which you could profitably engage without reference to the art at all. 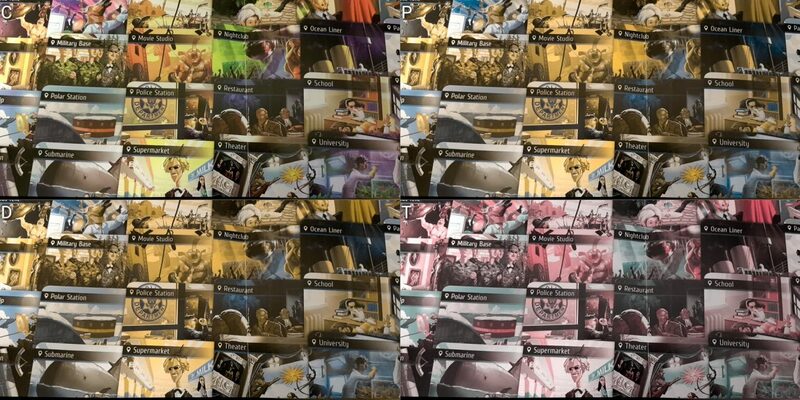 In fact, you could paper prototype a perfectly playable version of Spyfall that just lists the role and location on each of the player cards and it would be exactly the same. With the cards in this box though the text, especially related to the role, is quite small. Close inspection with an assistive aid will be necessary if some degree of light discrimination is possible, and the game is functionally unplayable without support if total blindness must be considered. Given that roles are secret, it’s not the case that a visually impaired player can simply ask the table for help either – they’re on their own here. However, this is one of the rare cases where close inspection of a game card might be a boon to the impacted player – few things say ‘I’m not the spy’ better than a prolonged exercise of reading the top and bottom of card. That’s effective even if it’s a cunning ruse. Aside from this initial setup issue for the totally blind the game is otherwise almost fully playable for anyone with any severity of visual impairment. In each round all you need to know is ‘who and where’, or ‘I’m the spy’. The rest of the game is one of quizzing and deduction. Body language comes into this to an extent, but everyday compensatory strategies for that will be as applicable here as they are in real world situations. The setup problem though is significant because there is no way a player at the game can help another with their role without betraying game information. The only way it can be done is through someone sitting out of a round so they can whisper the contents of the card to any affected players. That’s far from ideal, but it’s not an insurmountable problem given how the rounds are relatively quick in any case and even when involved in a round you spend more time watching than you spend doing. The final issue here is for the spy, because they need to make use of the reference chart for the locations (at least until they are substantively memorised). Since there are only twenty four of these it’s possible to create an accessibility aide that simply lists them in large print. That won’t help someone with total blindness of course, but in that case there are other workarounds such as text to speech that can provide the summary of locations when needed. It won’t be elegant, might leak game information, but would otherwise offer completely playability. We’re going to recommend Spyfall in this category. For most issues of visual impairment it should be completely playable with a little bit of extra time invested at the setup stage. For players with total blindness, it’s fully playable if someone is willing to sit out a round to assist with hidden role information. Some additional time will need to be spent in providing a few helpful tools for play to ease the difficulty in being the spy but aside from that it’s a game that will work for everyone. The ability to respond convincingly to questions and ask questions likely to elicit meaningful responses is core to play. You’re looking for questions that offer ‘approved parties’ entry to the circle of trust while denying that entry to the spy. While there is a simpler version of the game that doesn’t use the location roles, it’s still difficult to handle the communication portion in a way that is simultaneously cunning and conducive to discovery. Every question has to be a mini riddle, and it has to be constructed on the fly. For those with memory impairments, I’d go so far as to say the game makes itself functionally inaccessible. The solution to remembering locations we discussed in the review relies on people passing around the location grid to everyone who is answering a question. That only works because familiarity eventually turns this exercise in memorisation under stress into an action of recognition rather than recall. You use it to refresh your memory, rather than conduct an exhaustive cross reference of the questions asked and answered versus the set of locations. However, if long term memory is a consideration then this isn’t going to be nearly as effective – and it’s already not a great solution even in ideal circumstances. If you’re the spy you also need to remember every potentially exploitable nugget of information that came your way, and that can be difficult because exploitability itself is a function of the location and the group. Coupled to this is that there’s no state tracking in Spyfall – people ask questions and answer questions and you need to remember what they said and often to whom. Part of the problem here is that it’s not necessarily enough to remember the gist of an answer – the specific nuance of it might hold key gameplay information. Intonation and emphasis too can convey important details for those in the know. While each round only lasts eight minutes at most, there’s often a lot of subtlety of which each player must keep track. You need to remember who gave unconvincing answers, and what those answers were, and how they track with what you know other people know. A reading level is associated with the game. More important (since the art conveys location too) is the need for situational understanding of what a role within a location would mean and the reality of what that presence in that location would imply. For example, you need to know the substantive difference between a school and a university, or an ocean liner and a pirate ship. You need to know what jargon might be shared between them and which might be uniquely identifying. There is a real need for general knowledge to construct good questions and answer them in an effective way. ‘What have you got planned for the theatre tonight?’ would need someone to know that hospitals have theatres, casinos often contain theatres, ocean liners may well have a theatre on board, and restaurants are often a precursor to a night at the theatre. That’s not even counting the theatre location itself. We don’t recommend Spyfall for those where fluid intelligence is a key accessibility consideration, and don’t at all recommend it for anyone with memory impairments. If you’re not the spy, the emotional cost of play is primarily to be found in suddenly being the centre of attention and expected to do something useful. You’ll need to give an answer to a question that is meaningfully revelatory for those in the know but unhelpful for the spy. Usually too you need to do this quickly because hesitation is often interpreted as a sign of untrustworthiness. Then, once you’ve given your answer you need to construct a question that meets all the key requirements of the table. While you spend a lot of time in Spyfall simply watching and listening, there are occasionally moments where you become very much the focus – the spotlight gets switched on and turned your way. However, aside from this your only job is telling the truth in a way that doesn’t reveal too much of the truth. For the spy, it’s a different story – it’s much more intense, and the difficulty of your task will be amplified the earlier you’re called upon to testify. Unlike some social deduction games, you rarely need to outright lie and you never need to actually tell a convincing story about a falsehood. You’re not looking to sow deceit and disinformation, you’re just looking to get through the round without being accused. However, any question under those circumstances can be undesirably interrogative. Even the mundane, ‘What do you think of this place?’ has to be answered with all the delicacy of a bomb disposal expert examining a suspiciously abandoned parcel. It gets a little easier the more people have disclosed up to that point, but it never gets easy unless someone gives an especially obvious answer. That creates then an issue of mental representation of game state that might be difficult to navigate for people with certain emotional conditions. You’re looking to find common ground between what you know of an area and what everyone else co-located with you would know. As such, you’re building a compatible mental model and using that to identify what constitutes acceptable disclosure. That can be difficult in some circumstances since it is fundamentally an act of perceptual empathy. Having said all of this though, the model of social deductive used here does not stress deceit or argumentation, and is fundamentally one of simply trying to tell the truth but not the whole truth. The only serious form of deceit pantomime comes at the start of the game, where the spy must convincingly pretend the card they have been dealt contains information they need to memorise. We will offer a tentative recommendation here. There are very few problems for those with physical accessibility requirements. All you need is to be able to observe a card and hold its state either in memory or in a card holder. If passing around the location guide, that too is easily handled by another player at the table if necessary. If you squint, you can see Sid James leering away. And they say there are no good parts for women in Hollywood. 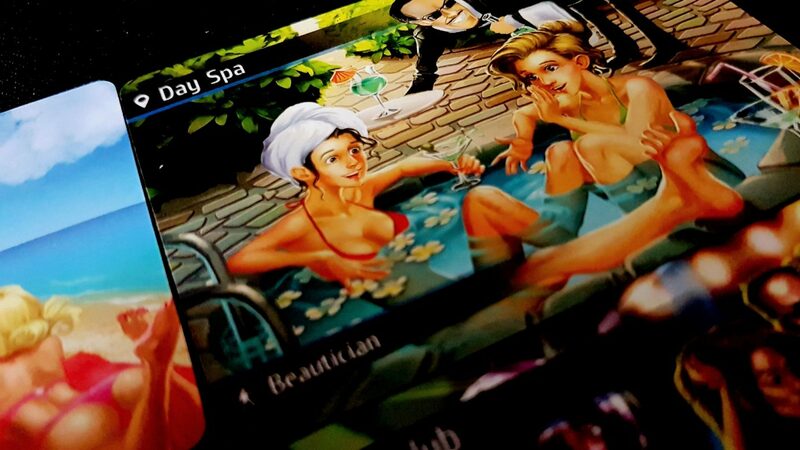 The woman spy however is seen nowhere in the game art once you open the box– it’s all focused on the goofy guy and his bawdy adventures in creepy voyeurism. Coupled to this too is that the locations being infiltrated here seem to have surprisingly few representatives of other ethnicities. Given the international jetsetter trope we are presumably supposed to believe our spy embodies, you would have expected a far richer tapestry of locations and cultures to be represented in the art. As it is, this is global geopolitics as viewed through a very narrow lens. 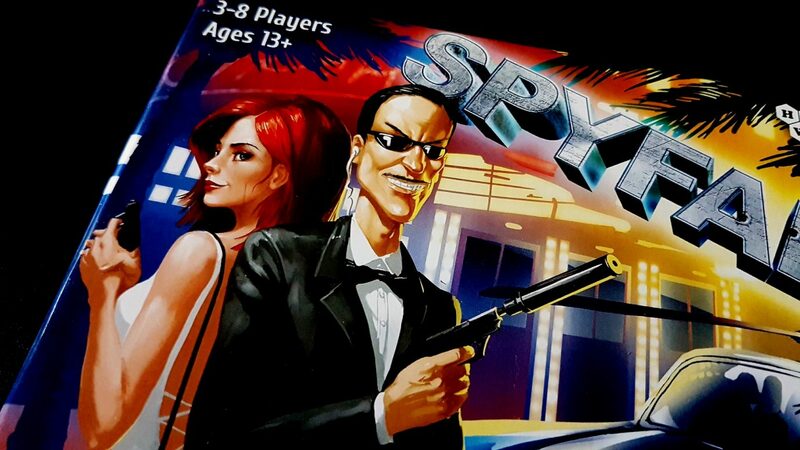 Spyfall is usually available for a comparative song – it retails at around an RRP of £20 and it cleanly supports as many as eight players out of the box. It’s terrible at three players though, only passable at four, and relies heavily on the right kind of people to be involved. It’s not particularly easy to mix players of differing skill levels and still end up with a satisfying experience. Cost wise though, it’s hard to fault and it certainly permits for large and varied groups even if it doesn’t necessarily thrive in those circumstances. We’ll tentatively recommend Spyfall in this category. A degree of literacy is useful here but not critical since each of the locations comes with distinctive art that can be used to graphically define the context of the area. Roles are not accompanied by art, but they can be omitted if the reading and interpretation of these is likely to be a problem. 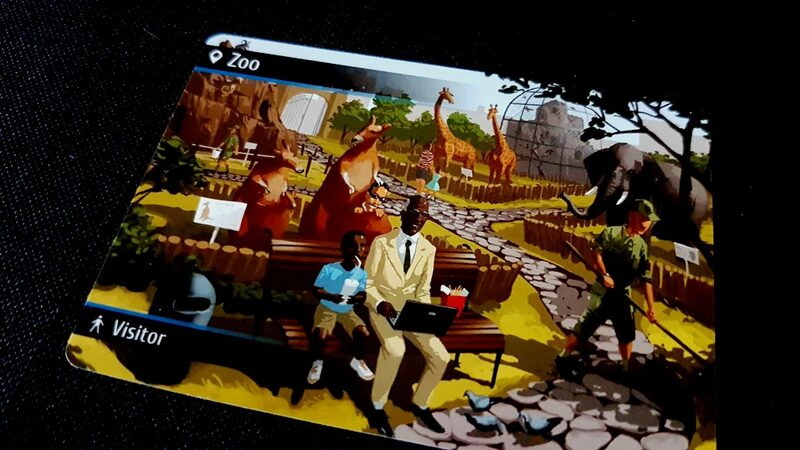 Spyfall requires less communication than many games in this broad genre but even as it reduces the density of discussion it adds considerably to the sophistication required. You need to be able to navigate and correctly stress synonyms, antonyms and all kinds of other grammatical constructs and interpret them correctly. You need to know that Schools and Universities have ‘terms’, but so too do military bases. You need to be aware that train can be a noun and a verb. People will be trying to impart secret information on the basis of this kind of thing, and an important part of play is being able to capitalise on it and make use of it yourself. This puts a big burden on precision and interpretation of language. The structure of each round takes away a lot of the parallel processing of discussion that often characterises these kind of games – it’s ‘ask and answer’ rather than ‘try to loudly talk over everyone to make your point’. Questions and answers too don’t have to be complicated to be effective, and they’ll mostly be drawn from real life experience and vocabulary. As usual in these teardowns, we’ll work on the assumption that within any particular gaming group there is a communication regime that works for everyone in the normal course of a day. We only address the complications that arise from the game itself. With that in mind, we’ll tentatively recommend Spyfall in this category. Where a condition of emotional impairment must be addressed in combination with a communicative impairment, we’d be inclined to recommend players avoid Spyfall. There are traps and pitfalls encoded into every question and answer and it can be especially frustrating to lose, or cause the table to lose, because a communication complication got in the way of conveying key information. Other than this, there are no significant intersectional complications that we can think of that would alter our existing recommendations in the various categories. Rounds of Spyfall can be quite intense if you’re the spy, but otherwise tend to be relatively low impact and last only eight minutes. As such, you can easily fit a few rounds of Spyfall around even conditions with highly variable symptoms of discomfort. If someone must drop out mid round, the costs aren’t high because the investment needed is low and success or failure doesn’t carry over heavily into future turns. Strictly speaking there’s a scoring system but you don’t even really need to pay it any attention if you don’t want to. Spyfall is a game though where players will actively be trying to catch each other out as best as possible, and if someone is the spy it’s in their best interests to sow as much distrust as they can. That can create, in competitive situations, the context for players taking advantage of accessibility related errors around the table. Someone with a communication impairment might not fully capture the meaning of something said, and this might then become a crack of doubt the spy can exploit to keep themselves safe. The extent to which this is likely to happen, and the extent to which you’d consider it a problem, is going to vary from group to group. We think Spyfall is a decent game that only becomes a great game within the rarefied context of an optimal group setup. It has a lot of passionate fans though, and its ease of play and rapidity of experience make it a firm favourite for many people. Accessibility wise though, it’s not a hugely encouraging story. The most significantly positive thing we can say here is that with a little bit of expended effort and some support from the table, Spyfall is completely playable without loss of experience or even game flow by players with even the most severe of visual impairments. Similarly for players with physical impairments that don’t present communicative difficulties – this is a game that can be played easily without any impact on the experience. For everyone else, the precision and subtlety needed to get the most out of the game causes a number of issues that we think would impact significantly upon enjoyment. We gave Spyfall three stars in our review – it gets rated considerably higher by many though, and as usual we’d advise you to be driven by your own feelings as opposed to ours. Even if you share our somewhat muted appreciation of what it offers, you don’t go far wrong in having something like this on your shelf if you think it’s a game you can meaningfully play,.